Sony has revealed a new tough camera to sit in its Cyber-Shot range of compacts. The TX30 features a 5x optical zoom lens and is the world's slimmest digital compact camera that's waterproof down to 10 metres (33ft). The camera is also dustproof, shockproof and freezeproof, and is capable of recording Full HD video. A new feature for Cyber-Shot cameras is magnifying glass plus mode, which enables you to zoom in and magnify a subject up to 15x for a "super size" view. The camera also features LED lights to illuminate dim scenes for detailed close-up shots. Inside the camera is an 18.2 million pixel Exmor R CMOS sensor and a Bionz processor. At the back of the camera, a 3.3-inch 1229k dot OLED screen can be found. As with other new Cyber-Shots also announced today, the Sony TX30 features Enhanced Superior Auto mode, which automatically matches the best settings for the shooting situation in front of it. The camera also features a number of other advanced modes and settings, including Picture Effects and Beauty Effects. 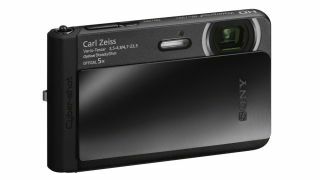 The Sony TX30 will be available from April 2013, but a price is yet to be determined.